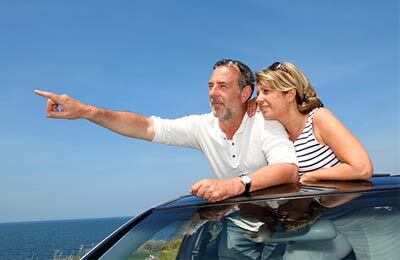 You can use AFerry to book a Bintan Resort ferry to Indonesia and Singapore. 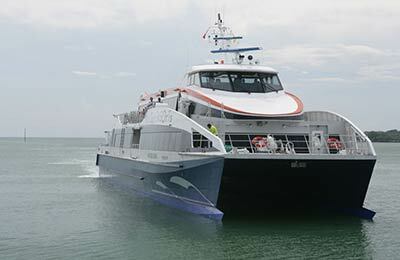 Bintan uses four catermaran ferries, each with a capacity of around 300 seats. AFerry always has cheap prices for Bintan Resort Ferries and the latest special offers. 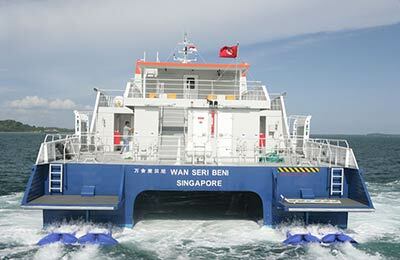 You can use AFerry to book Bintan Resort ferries to Tanah Merah and Bandar BentanTelani. See below for the latest Bintan ferry prices and sailing times. Click on your ferry route for a detailed Bintan timetable with arrival and departure times. If you happen to feel peckish while on board, look no further than the Bintan Resort Ferries Deli where you will find an extensive range of snacks and refreshments. To further enhance your experience with Bintan Resort Ferries, upgrade to the premium Emerald Class - this will give you access to spacious seats, complimentary hot beverages and priority boarding. You can choose Emerald Class when selecting your accommodation type. Whether you use the Bintan Tanah Merah Bandar BentanTelani ferry route, or the Bandar BentanTelani Tanah Merah ferry service you are bound to have a relaxing and enjoyable journey. How long before departure should I arrive for Bintan Resort Ferries? Check-in is at least 40 minutes before departure for all passengers.